I'm a napoleonics newbie and would like to start playing black powder in scale 1/72. Just find it kind of hard to decide how to base, 4 figures per base or 6? Base size ? 40x40mm or reduce it to 30x30mm? I have got 1 box italeri french infantry (48 pc's), 2 boxes british infantry (96pcs) and 1 box light cavalry each (17 pcs) and 1 box artillery per side… What can I make out of this? What do you suggest for the basing? Size ? Total figures? What kind of base do you suggest? Cardboard, plasticard,…? Most folk I know use 40x40 bases with 4 figures for line infantry when they start of using Black Powder. 50 x 50 with 2 mounted figures for cavalry. Players with older based figures sometimes use 45 x 40-50 with 6 figures per base. It depends on the casting whether they can fit. It doesn't really matter as long as you can represent small, standard and large units. MDF is the basing material for most, 2mm thick or 3mm thick if you are all thumbs. However if you want to play other rule sets like Sharp Practice you might want to single base your figures and mount them on sabots. Ask here again if you are unsure. I would recommend bases based upon what I use but reduced for 1/72 (20mm). Therefore I would mount six infantry in two ranks on a 30mm by 30mm. This gives a relatively tight formation (realistically) with space at the front for waving swords and out thrust bayonets. For the French this could be six bases to the battalion with each base representing a company. Cavalry could be three figures in a single rank on a base 40mm x 40mm. This could represent a troop (or company for the French). As far as basing is concerned, I use thin sheet metal bases so that they can be carried on unit trays covered by magnetic 'paper' from Magnetic Bases/Coritani. Around the figure bases is filled in with Milliput or similar. I hate to answer a question with a question but… Why Black Powder? 1) Is it what people are playing around you? If so, and your goal is to be able to bring some troops to game with them then do what they do. Most BP players that I know use 28mm (plastic and metal) which are in no way compatible with 1/72. 2) Are you just wanting to test drive the rules as economically as possible? If so, then I assume you are mostly solo gaming in which case do whatever works for you. I personally love 1/72's and have since the late 70's. I base Napoleonics on 1/4 inch think bass wood. I find that a thick base gives you something to grab other than the figures and gives the bases some weight. As has been mentioned above you might want to base in a way that allows you to represent small, standard and large units. Since BP doesn't rely on figure count it's really bases per unit. One option would be if you wanted to use square bases then two bases for a small unit, 3 – standard, 4 – large. (btw I know that BP calls for single based guns but I like to use 2 bases per battery, side by side when deployed and end to end when limbered) I would go to your local home labyrinth and look for sheets of ceramic tile. Each tile is just under 2"x2" and you can always find a few sheet that have a cracked tile and get them at a reduced rate. I use them for my 1/72 TYW/ECW figures. The other option is to use bass wood from a craft store cut to 1"x2" strips. 4 bases a small unit, 6 – standard, 8 – large. One word of warning. You sound like you are trying to hedge your bets which is something you just can't do in Napoleonic's. Most players have figures in multiple scales based for various rule sets. My advise is to bite the bullet and go all in. Find someone around you who has been playing for a long time. What figures do they have and what rule set(s) do they favor? BP can be a flavor of the month for some folks. 28mm plastics seem to be the current rage. Good Luck! I did say during that game I wish I'd gone for 4x 30mm square, just easier to move. As has been said matching how your opponents base theirs is key unless you are providing both sides for any games you intend to play. 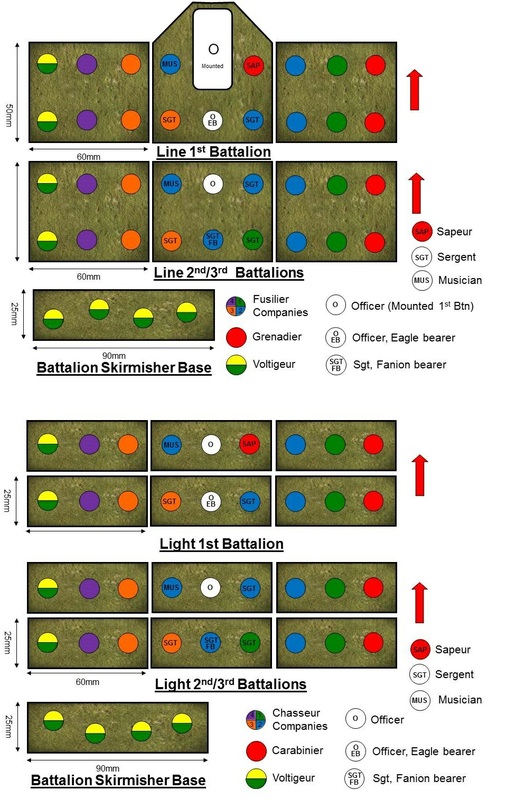 At our club we play Black Powder but also Shako 2 and as a lot of the members' figures were based for this, slightly earlier, rule set we have stuck with it as our default basing system. Black Powder only requires both sides to be based similarly so that works. It also means we use less figures to represent a battalion than a lot of Black Powder players so it's a bit more economical, if there is such a thing in napoleonics! Whatever you do, base in two ranks. It just looks so much better than single-ranked figures. You will find plasticsoldierreview.com to be an invaluable resource. I'll try to post some pics of my figures based as described above soon. Unfortunately it sounds like when it come to 1/72 British, you've got one of the worst sets available. Even the old Airfix is a better set for the British IMO. Another problem you'll run into is that for some reason no manufacture accounts for the fact that the British had two ensigns in each battalion as they carried two different flags. The Hat command set can help remedy this for you. You'll want to add some rifles and some light infantry. Both the Ehmar and Hat peninsula infantry are good sets for that since the light infantry retained the stove pipe shako and did not carry, or at least were not supposed to carry flags. I'm more of a gamer than a painter and even less of a photographer! I base my figures using the old "standard" which is 15mm frontage by 20mm deep. And because I am "old school" I use a 1:20 ratio – from the days of Peter Gilder.. But recent development is to look at the General d'Armee rules, and my plan is to just use four of my bases as a standard unit. That way each unit is smaller on the table, so I can have more units, which for Gd'A is good, as it needs units organise dinto brigades, and the more brigades you have, the more interesting the rules mechanisms are.